SDI specialise in service improvement for service desks. Let us help you deliver the results you need to be brilliant. Well defined and easy to follow service improvement plans are key to any high performing service desk. SDI work with companies all over the world to help improve specific areas of their service. We provide practical step by step advice, guidance and support in order to transform your service into a top performing service desk operation. We can offer a solution for any budget, whether it’s a one day practical service improvement workshop or a six month tool selection and implementation project. Our plans are completely adjustable to your service desk. We do this to ensure that your team, budget, goals and organisation are always at the forefront of the process, in order to attain the best possible results for service improvement. The plans we offer can focus on any aspect of your service desk whether that be people, processes, technology or something else. It’s up to you what improvement area you’d like to focus on and your plan will be tailored to your exact needs. See tangible results and improved metrics…and much more! Use the form on this page to get in touch about our service improvement support. Tell us about the challenges you’re facing or what you’d like to achieve. Let us help you find the solution quickly, easily and effectively! 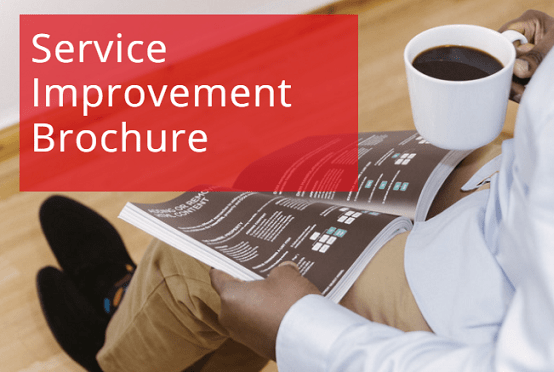 Download the Service Improvement Brochure for more info. Click Here for: Insight, events and the latest on Tools & Tech from the service desk community.